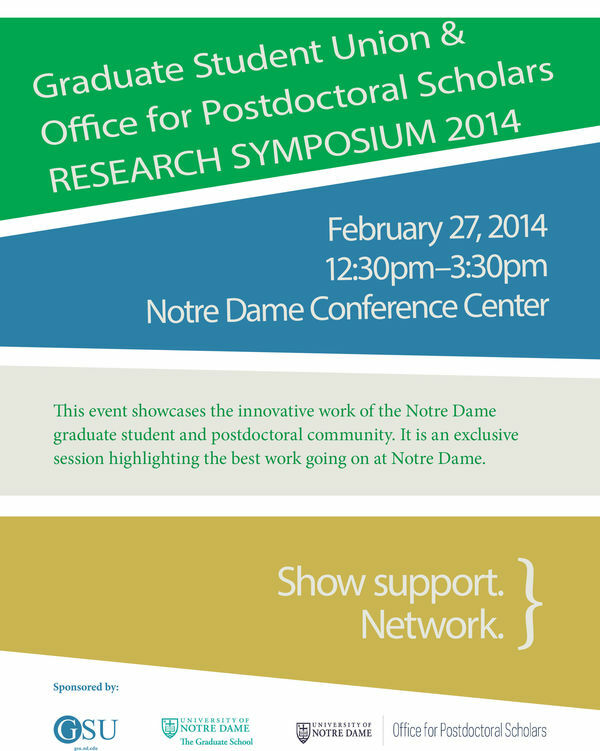 The Graduate Student Union and Office for Postdoctoral Scholars Research Symposium will be held on Thursday, Feb. 27, from 12:30 p.m. until 4:00 p.m. in the Notre Dame Conference Center (lower level, McKenna Hall). The symposium, hosted by the Graduate Student Union and the Office for Postdoctoral Scholars, showcases the research accomplishments of graduate students and postdoctoral scholars in Engineering, Humanities, Science, and Social Science. The symposium provides a scholarly but informal environment for graduate students and postdocs to present their research to the larger campus community. The awards ceremony will be from 3:30 to 4:00. Originally published by Mary Hendriksen at graduateschool.nd.edu on February 26, 2014.